Is it a watch or modern art? What we do know for sure is that the timepieces from the Swiss manufacturer MB&F are among the most extravagant works out there. Many of the futuristic-looking watches made of gold and platinum could pass as sculptures. MB&F stands for Maximilian Büsser & Friends. Büsser founded the company in 2005 and has managed to cause quite a stir in a short amount of time. MB&F perceives itself as a bold laboratory rebelling against the established watch industry. The watchmaker employs innovative concepts for their pieces, but still finishes them in gold and platinum. MB&F doesn't limit itself to wristwatches, though. They are also an inventive developer of clocks with a style somewhere between steampunk and science fiction. The pieces created by MB&F aren't simply watches and clocks: They are machines. The timepieces are categorized into two collections, the Horological Machines and Legacy Machines. Additionally, there is a Performance Art collection with a handful of wondrous clocks and watches. The Horological Machines collection consists of nine watches. The HM1 starts everything off with its white or red gold case in the form of a horizontal figure 8. The case measures 41 x 64 x 14 mm, enough space to house 376 different pieces and four barrels, which simultaneously send their energy from two sources to the escapement. This is the first wristwatch in the world to feature four barrels. A centrally-located tourbillon minimizes the negative affect of gravity on the watch's precision. The HM1 features separate hour and minute dials as well as a power reserve of seven days with its own indicator. The HM4 was inspired by airplane cockpit displays. Büsser enjoyed assembling model airplane kits as a child and revived his childhood memories in the form of the 3D HM4. The watch consists of two fuselage-shaped instruments next to one another. The right dial has two hands and shows the time while the left is the power reserve indicator. The "engine" is located in the middle, a hand-wound movement with a power reserve of 72 hours. The case (54 x 52 x 24 mm) is available in titanium and red gold. The HM5 On the Road Again abandons hands in favor of displaying the time in a small window. You don't even need to remove your hands from the steering wheel to read the time. The wedge-shaped case should look familiar to fans of futuristic-style cars from the 60s and 70s, such as the Alfa Romeo Carabo from 1968. The watch also pays homage to the Amida Digitrend, a driver's watch from 1976 with a similar display system. The HM5 is powered by an automatic movement with a power reserve of 42 hours. The Legacy Machines are the result of Maximilian Büsser wondering what kind of watches MB&F would have made had they been founded 100 years earlier. There were no fighter jets or Star Wars films back then to serve as inspiration. Rather, watchmakers would have been inspired by the magnificence of the Eiffel Tower or the alluring futuristic novels by Jules Verne. The LM1 is the first answer to Büsser's question. Important parts of the movement were shifted upwards so they could be viewed in motion. A dial with Roman numerals is located both to the left and right of the elevated balance wheel, allowing the wearer to keep track of the time in two time zones. Another model in the collection is the Legacy Machine Perpetual, powered by the newly developed caliber 581. The caliber features a perpetual calendar, but lacks the problems that usually accompany such a complication: It no longer accidentally skips days and its gears don't jam. The LM Perpetual is a skeleton watch, meaning it offers an unobscured view of its sophisticated movement swinging at the relatively slow pace of 18,000 vibrations per hour (2.5 Hz). The case has a diameter of 44 mm, a thickness of 17.5 mm, and is available in red gold or platinum. 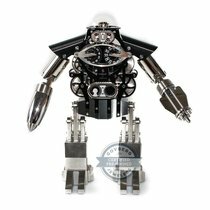 MB&F's Performance Art collection features a series of exceptionally unique timepieces, such as Sherman the friendly robot. He rolls around on his rubber caterpillar tracks and has a clock on his torso with two blued hands. Available in palladium-plated or gold-plated versions, Sherman is 14.3 cm tall and made of 200 pieces. Another piece, the Arachnophobia, also features a clock body. Its caliber rests on eight spider legs and is wound via a key. When its legs are outstretched, the Arachnophobia is 20 cm tall. The yellow gold-plated version weighs almost 2 kg. The Starfleet Machine resembles a spaceship and is 21 cm tall with a diameter of 29 cm. It also has a movement that is key-wound. The Starfleet Machine's movement is located in the middle of the clock, and its power reserve lasts almost six weeks. A black dome over its caliber displays the hours and minutes. The surrounding metal body is made of stainless steel and is also available in a version plated with ruthenium-treated brass. It was created by L'Epée 1839, the last Swiss manufacturer of high-end calibers for grandfather and wall clocks. L'Epée 1839 was also responsible for ensuring Sherman the robot keeps time reliably and accurately. MB&F works together with notable artists, such as Jennifer Townley from the Netherlands, to make these ideas a reality. Since 2008, Townley has gained considerable attention for her mechanical sculptures. The Performance Art timepieces speak to the same kind of people who have analog record players in order to enjoy the movement and sophisticated mechanics. The price for one of these MB&F timepieces starts at the lower end of the five-digit range. Company founder Maximilian Büsser was born in 1967 in Milan, Italy. He founded MB&F in July 2005, following an already successful watchmaking career. He received his master's degree in micro-technology from the Swiss Federal Institute of Technology in Lausanne in 1991 and began his career at Jaeger-LeCoultre. He remained there for seven years and was responsible for product development as well as European sales and marketing. In 1998, he began working for jeweler Harry Winston, leading the rare timepieces division. He increased company sales by 900%. While searching for new challenges, he joined forces with his business partner Serge Kriknoff in 2005. Their first product, the Horological Machine No. 1, came out in 2007. MB&F has shaken up the luxury watch market in big ways with their timepieces and sculptures. Their products appeal most to those who love the modern and unusual, and to those who view watches not just as practical instruments, but also as head-turning statement pieces. Hublot has a been successful in a similar niche. Technology fans will also get their money's worth, seeing as the calibers represent the highest quality watchmaking.